I’ve always wanted to try taking my son to school in the fancy Mountain Equipment Coop trailer I got for my birthday a couple of years back. 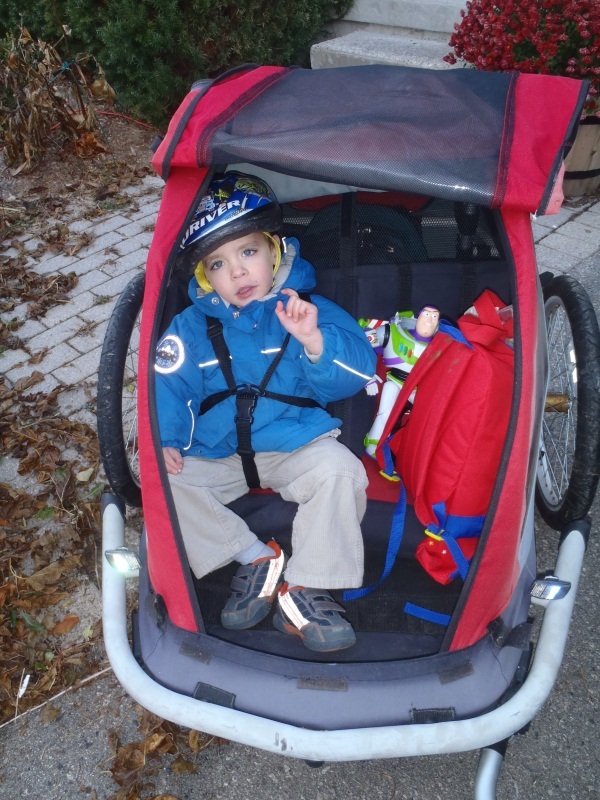 Yes, I asked for the trailer as I wanted to start cycling and taking my boy on trips as soon as he was old enough. Indeed I did take him here and there but it wasn’t much and soon the trailer collected dust rather quickly in our front hall/makeshift garage/makeshift shed/trunk wherever it could be hidden. It’s not the small trailer either, it’s the double! We knew we were having two children at some point so we were thinking ahead. Genius! I’m thinking now that my three year investment in this trailer will pay off next summer when my youngest is old enough to don the helmet and get in on the fun. I just hope the oldest isn’t over it by then. I decided that Tuesday of this past week was the day I would try taking my oldest to his pre-school. I planned carefully and the night before I had all my gear ready, my backpack and his packed and ready to go. The trailer was brought out and dusted off, and I found my son’s helmet and made some adjustments to ensure it still fit. All good and ready to go. The next morning I was up earlier to ensure plenty of time. For this first trip the plan was to only do the drop off in the morning and my wife would pick him up after work as I would be working late. Not wanting to drag the trailer unnecessarily to work and back my plan was to drop it back off at home and then head to work after the trip was complete. To be fair, his school is only about 1.5km away so the trip should be short and sweet. OK, so I packed up the boy, the backpack and buzz lightyear and off we went! Indeed it was short and the drop went smoothly. I left what I thought was plenty of time to return back to the house, drop off the trailer and continue on to work. I’m not sure how, but things just ended up taking a long time for some reason. I gave myself 15minutes total to get to the school drop off the boy and get home and unhook the trailer. It took more like 25 minutes. Unhooked and off I went. Two things I learned from the drop off process. 1. A kickstand is a necessity when you have a trailer (and no car to lean the bike against unlike during my departure!) and 2. you need to schedule more time to ensure being on time for work. I ended up only being a minute or so late arriving at work technically, but of course I had to get cleaned up and dressed and thus making myself 15 minutes late for work in reality. One bright spot, when I arrived in the parking lot at work, my lovely wife was there dropping off the car for me at the same time. Seems I took about the same amount of time with my entire ordeal as it takes my wife to drop off our other son and get a coffee. (Yes, I need the car during the day to get to school and back for my part-time course that runs in the middle of 3 days a week. walks to her job from my parking lot.). Not sure if I will try the drop and drop again this year, but it might work well in the spring and summer when getting kids dressed and out the door is faster and thus giving me ample time to get all the things done to ensure timely work arrival. The other attempt I might make is to pick him up too. Trouble is, what to safely do with the trailer while he is at school? I don’t want to drag it to work and back. Might have to come up with a two lock system for the trailer and lock it to the bike rack at the school. Not sure how I feel about that (destruct-o kids and all around there I am sure) but the fact that the rack is close to the front of the school where plenty of people are and not likely many kids hanging out makes me feel a bit better. Generally I found this to be a successful attempt and I will attempt more come fairer weather! Soon enough I will be able to transport both boys, although I am going to have to work on my leg power! To be honest I’m not concerned about me, it’s more about the safety and comfort for my daughter. I’ll have to try before it becomes too cold out. I think I have a route that’s mostly on trails and off major roads. You could leave early and drive out there without her in it to bring up your comfort level. Is there a playground there? Go on a Saturday under the guise of going to the playground. Gives you the chance to test out your route.